The 22 mini-cascades and numerous swimming holes that make up the Mayfield Falls in the low-lying Dolphin Head Mountains make a memorable day trip from Negril. 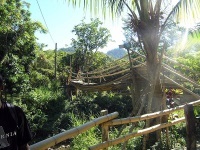 Tours offer guided walks through bamboo-shaded cool water holes and splashing falls. Swimwear and mosquito repellent are highly recommended, as are waterproof shoes. Some parts of the walk through the area involve natural whirlpools; in others, blasts of water hit you from the rocks. There is an underwater cave to swim through, smooth rockslide areas and mini cliffs to dive from for the adventurous. This natural water park is edged and overhung with bamboo, flowers, vines, trees and shrubbery. Jamaican dishes are available at the eatery at the entry point, where tourists can order meals before setting off. There are also a number of stalls selling souvenirs and crafts at the end of the trail.